Tubes slabs broadsides are towards the hearth that towards the plating, reached or joints of expansion on the hearth; with these constructive characteristics the various expansions of the hearth and the plating come absorbed from the parts curves and they do not weigh on on the weldings or the flat parts of slabs to tubiere with consequent crack of fatigue of the material. Wide combustion chamber and low thermal cargos (1.000.000 - 1.200.000 Kcal/m³h) so as to not to subject the body boiler to temperature stresses that limit the duration of the same one. Combustion pressurized with values in combustion chamber that vary from a minimum of 30 milimeter of 100 H²O to one max of milimeter of H²O to second of the types of boiler, fuel and cargo. Losses for lessened radiation reduced (2-3%) for the use of non-conductor materials are on the plating that on smokeboxes (the fiber glass, refractory ceramic fiber, pastes, insulators briks) of remarkable effectiveness. Possibility of several fuel employment: gas methane and others, diesel oil, fuel oil. Contained specific production (35 Kg/h), width room and vapor dome avoid tumultuous vaporizations and allow one vapor production much dry ground (title it of vapor 0,97); remarkable a specific ability (approximately 2 lt/Kg vapor) concurs accumulates of such vapor to avoid lowerings of pressure during the demands for tip. The generator comes supplied in the version monoblock, suit of taps of best houses (KSB, BONT, KLINGER) electric pump of feeding-injector-regolator of level to floater (attack and detaches electic pump of feeding, block burner to level minimal) - probe block burner to the minimal level with manual rearmament pressure switch of block with rearmament operation-picture handbook-pressure switches electrical worker control with connections to the several equipment. Upon request the combustion system can be supplied. In the generating saying planning it has been attempted to render elementary is the use that the maintenance, equipping it of simple but at the same time reliable equipment. 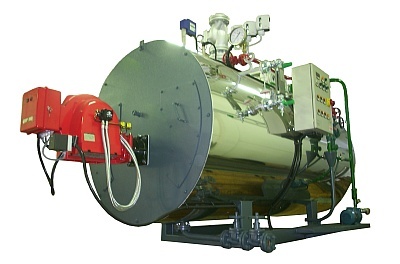 Smokeboxes are easy removable and they are equipped of revolving arms, for being able to render the hearth and the tubes bundle for cleaning, the tests and eventual extraordinary reviews after operation years visible. MAS snc reserves the right to make any modification considered necessary without notice.